I am surrounded by experts, experts that love giving advices. The most common subject of advices directed at me is my marital status and lack of biological offsprint. Apparently, I NEED to have a kid, like, 10 years ago. If I have a nickle for every time someone tells me why I should have a biological child, I’d be paying off the debt of the Philippines… twice. Below are some of the reasons presented to me and these are the very reasons I am convinced I shouldn’t have a biological child, at least not yet. It is NOT okay to expect someone to devote their life, in its entirety or part of it, for someone else. We aren’t exactly passing on a pristine world to them and then you put it on them to take care of you. Thanks but no thanks. I did raise a child who voluntarily said she will take care of me when I grow old. It is highly appreciated but I insist on declining. I raised her so she can live HER life, not mine. I have savings to ensure I can pay someone to take care of me IF it gets to that. If I am to raise another child, I expect nothing but for her or him to pursue her dreams with no baggages, nothing to hold her or him back, no obligations. I am going to raise a human being, not a slave. It is mine, I see no reason you should be worried about it. If I am to be completely honest, it’s a little creepy you are thinking about my eggs. I try to do that everyday. In the little things and in the biggest things I can manage. It may not be much to others but, more often than not, I give all I can give. You should to. If you aren’t doing it everyday, there's something wrong and not with me. If you expect your child to complete you, logic dictates that the child is nothing more than a piece of a puzzle and the puzzle is you. One, that is highly vain, which is not really a surprise, but nonetheless wrong. 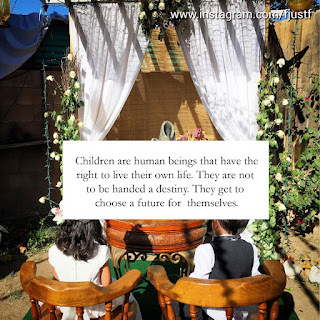 Two, a child is a human being. She or he, like you, should be complete. The child isn’t some puzzle piece you attach to some part of you to make you complete. Third, the ONLY way you can be the best mother you can be is when you are already complete as a woman WITHOUT a child. You were already born into one and you had an entire life to form new ones. Like it or not, those are your families. If you are still looking for families, it is most likely not a family you are looking for. Your issues are much deeper and I highly suggest you work on that before dragging another human into it. Some people have built an empire, real or imaginary, and they want “their own” to inherit it. You see, it’s your empire. Yours. Not the child’s empire. The child, when he or she gets to the right age, MUST have the freedom to choose what to do with his or her life. You don’t assign the child’s destiny. Even heirs to the throne are given the freedom to “pass off” the crown. FYI, the child isn’t going to be married to you or your husband. She has nothing to do with your marriage. Yes, having a child is like brushing your teeth. You just want to get it over with. There are a lot of children in the world that need love. If you love children, look around. Yes, being a woman is all about using your ovaries and eggs. Yes, yes. Very smart. I already raised a child and will most likely have another one, biological or through adoption but it won’t be for any of the reasons stated above. I will have a child when I am ready to love unconditionally.